We are proud to be one of the few US tea companies to receive fresh new seasonal teas by air shipment in the spring. These teas are only several days to two-to-three weeks old when they arrive at our store. Giving our customers the opportunity to drink tea this fresh makes us happy and is something that we at Tea Trekker are proud of. Fresh tea such as this is a tea-drinking experience that we wish all tea drinkers could experience! Aaaahhhh……. the loveliness of fresh spring tea. Vibrant in color and fresh and sweet in flavor, first-of- the-season teas mark the arrival of a new tea year. There is nothing more exciting for tea drinkers than the first of a season’s new harvest tea. In China, this would be a Pre-Qing Ming or Yu Qian tea, whereas in India’s famous Himalaya tea-growing region of Darjeeling it is the 1st and 2nd Flush harvests that are most highly revered. 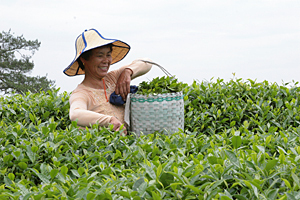 Throughout the traditional tea-growing regions of the world, unique seasonal specialties are produced in limited supply during the fleeting time of each season. These teas are highly sought-after, as tea from each season is only made once each year. Spring teas are made from the emerging tea buds and leaves of tea bushes awakening from winter dormancy. The time for plucking small, tender leaves is fleeting and the opportunity for manufacturing spring teas ends almost as quickly as it began. Anticipation for the arrival of new teas in the local markets is high. 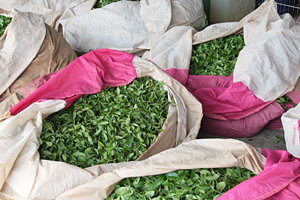 As the spring season gets underway in different regions of the major tea producing countries, new types of green, white and black teas come to market as soon as their time of the season arrives. In a sense, these early spring teas are made from baby tea leaves that are delicious, ‘just born’ expressions of the flavor of the tea. As such, these teas are vigorous and bursting with flavor and contain a large amount of beneficial plant nutrient. 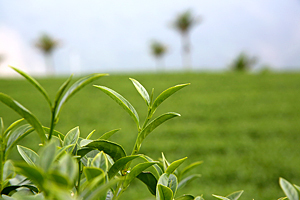 In just a few weeks time, the leaves on the tea bushes will grow too large to be baby tea leaves any longer this year. The leaves will grow and produce mid-spring teas ( teenagers ! ) and by summer the full-sized leaves will produce milder green teas ( adults ). While ‘tea’ is available 365 days a year in the marketplace, in truth certain premium teas are seasonal, so are neither manufactured throughout the year, nor meant to be drunk year round. Premium teas are only made for a short time in the spring, or the fall, or the winter depending on the type of tea. Spring is the time during which the largest amount of the premium-grade, China-bush teas that Tea Trekker purchases are made every year. 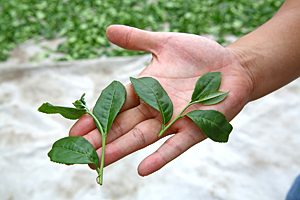 Production occurs during a period of a few short weeks and these teas are not made again until the same time the following year. Good examples of this are our early spring Chinese pre-Qing Ming and Yu Qian green teas from China; 1st & 2nd flush Darjeeling black teas from India; new-harvest white, black, and oolong tea from Nepal; and Shincha & Ichibancha green tea from Japan. Some premium teas, such as Chinese oolongs, black teas and Pu-erh; Taiwan oolongs and several of our Nepal teas have both a spring harvest and a fall harvest. Spring teas are prized for outstanding flavor while fall teas are considered best for body and aroma. Summer harvests are for standard, commercial grade teas which find their way to supermarket shelves. In each season weather affects delicacy, sweetness and astringency. From early spring through to early winter, the forces of nature, combined with the effects of geography and terroir, have a direct influence on the flavor, aroma and appearance of tea. Knowing what season a tea was plucked in reveals important information about what to expect in the flavor and aroma of that tea. With all teas, there is a season in which each tea is made and a time when it is best to drink it. Some teas are best aged, or rested, and others not. We believe that all tea has a ‘sweet spot’ when the flavor is the most satisfying. Sometimes this is right after manufacture, such as letting a fresh green tea sit for a few weeks before drinking, and for some heavily roasted teas it can require a few weeks, months or years of resting or aging to mellow. Understanding when a tea is best to drink can make a difference in the enjoyment of that tea.